As in Formula 1, the maxi yacht racing circuit takes elite sports teams around the world, in this case chasing glory in glamorous yachting competitions. But keeping a cutting edge, carbon fibre, high-tech maxi yacht in top condition away from home is far from easy. So each of the elite teams bring their workshops on the road with them, usually in one or two shipping containers dedicated to yacht maintenance. Many of the sailors who regularly crew on the yachts double in a marine trade, be it sailmaking, rigging, hydraulics, carbon fibre work, etc. 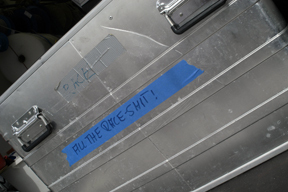 allowing the teams to fix just about anything that they break out on the race course. Iain Smith is the logistics manager for Wild Oats , responsible for managing the team, shoreside logistics and moving the boat around the world. On board, when racing, he runs the foredeck. Here he tells us about the shore side set-up for Wild Oats. Smith says Wild Oats has been lucky, not suffering any major failures to date. But the travelling takes its toll. Stephan Kessenich has a similar role with the 30.5-metre Wally, Y3K, which has one of the slickest set-ups on display here in Porto Cervo. 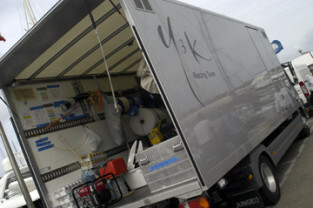 Its distinctive panel truck is parked on the dock, in front of the boat, filled with spares and tools. “This truck has some of the racing sails, foul weather gear, rigging, racing equipment and spare parts and tools. It has the stuff we need on-site for if we break something,” Kessenich says. Of course, preventing breakages in the first place is a big part of any racing yacht programme. If it never breaks in the first place, you don’t have to fix it. On a day like today, when the Mistral wind is gusting over 40-knots, it is this type of maintenance that breeds confidence that these cutting edge racing machines would make it around the race course intact. Of course, if you can’t get off the dock because of the wind, that’s another story?and, if nothing else, more time for maintenance.